Renew Life’s Ultimate Flora Men’s Complete (Ultimate Flora Mens Complete) is a high-potency “clean” formula marketed to be designed to re-establish digestive balance, help reduce occasional gas, promote colon health as well as promote digestive and immune health. It does not have to be used exclusively by men. 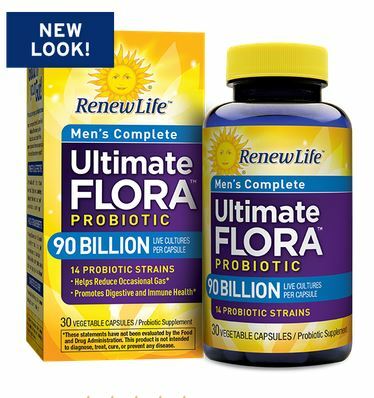 What Probiotic Strains are in Ultimate Flora Mens Complete? There are 14 scientifically studied probiotic strains in this supplement, and there are actually more than 90 billion CFU immediately after manufacture to account for any losses during transit. What are the Other Ingredients in Ultimate Flora Mens Complete? The other ingredients at the time of this writing (July, 2016) are very limited and are vegetable capsule (vegetable fiber and water) and cellulose. The capsule provides some delayed release of the probiotics. Please verify ingredients of any supplement prior to taking it. What is the Recommended Dosage of Ultimate Flora Mens Complete? The manufacturer’s recommended dosage is one capsule daily, with or without food. I recommend that you take lactic acid bacteria probiotic supplements such as this one with at least a little bit of food to increase their survival percentages. What are the Pros of Ultimate Flora Mens Complete? What are the Cons of Ultimate Flora Mens Complete? Only the total CFU is given for each genus; you don't know how much of each species is present. As with most probiotic supplements, this one requires refrigeration after it is delivered and opened. No studies with this supplement as a whole supplement have been performed to my knowledge. Note that this is not unusual, however. Very few multi-species probiotic supplements are used in studies. Instead, species and strains that are show to be effective are mixed together in most multi-species supplements such as this one. Compared to other multi-species probiotic supplements, this one contains a high number of total CFU of 90 billion per capsule, but with 14 different strains, some of those strains may have negligible amounts. There is no way to know. Where to Find Ultimate Flora Mens Complete? Note that this product is not usually shipped with a cold pack, even from the manufacturer. The manufacturer believes that shipping without if fine as long as the product is refrigerated upon receipt. Is Ultimate Flora Mens Complete the Right Supplement for YOU? If you would like help in determining if this probiotic supplement is right for you, please consider nutritional consultations with me. A supplement is just that: supplemental to other healthy lifestyle factors. A supplement should not replace good eating habits and taking care of oneself and nutrition consultations can certainly help with those. This supplement is a high potency supplement with no unnecessary additives (a "clean" supplement), has "safe" species of Lactobacillus and Bifidobacterium, is free of most allergens and is packaged securely. With the high numbers of Bifidobacterium and moderately high numbers of Lactobacillus, it would be expected to fulfill its marketing claims of re-establishment of digestive balance, help in reduction of occasional gas, promotion of colon health as well as promotion of digestive and immune health. Note that although this supplement is marketed for men, it can be suitable for women, also, and at least one of the reviews was written by a woman. While Ultimate Flora Mens Complete does not have all of the usual Lactobacillus species associated with vaginal health in studies, there are many species in it that are associated with vaginal and urinary tract health. Renew Life is a reputable company focused on digestive wellness. Thanks to Robert for suggesting a review of this supplement!